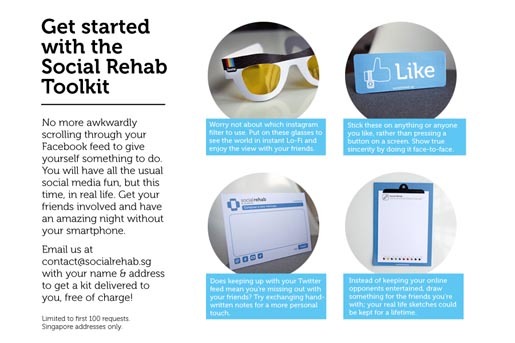 Members of BBH global internship program the Barn have launched the website www.SocialRehab.sg, providing a toolkit to help people recover from smartphone addiction, which in return enables people to connect with life outside of their smartphone. 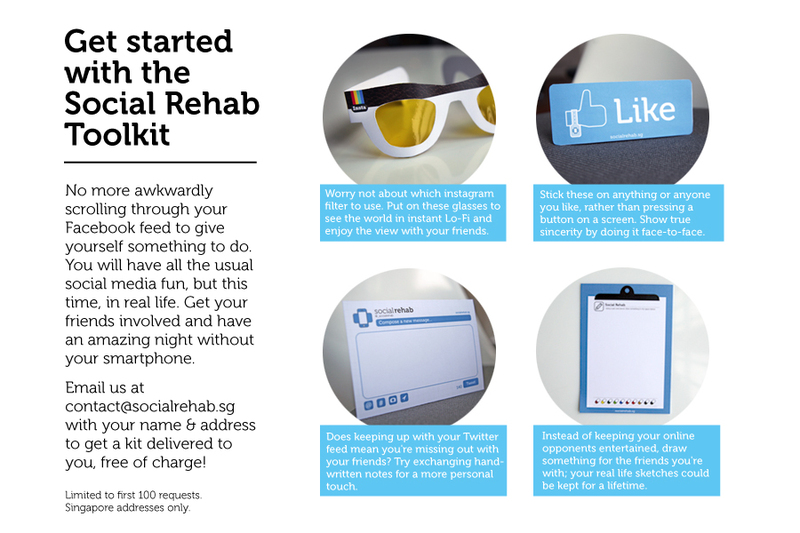 The Social Rehab toolkit takes elements of the digital world and creates tangible items such as Instaglasses instead of Instagram, ‘Twitter’ note cards instead of digital Tweets, ‘Like’ stickers instead of the ‘Like’ button and ‘Draw Something’ doodle pads instead of a smartphone application. All of these items aim to promote real life interactions over impersonal digital ones. The campaign rounds off with an event held at one of Singapore’s leading nightspots, Loof, The Rooftop Bar on 4th August 2012. Are you tired of repeating yourself or being ignored by your friends because they are too busy on their smartphone? Social Rehab offers people the tools to enjoy real life social interactions between friends, rather than turning to their smartphones for entertainment. The campaign is leading Singapore, the country with the world’s highest iOS penetration rate, in the fight against poor cellphone etiquette. According to a recent survey, 24% of people have missed out on experiencing important moments because they were too busy documenting it with their smartphones for online sharing. 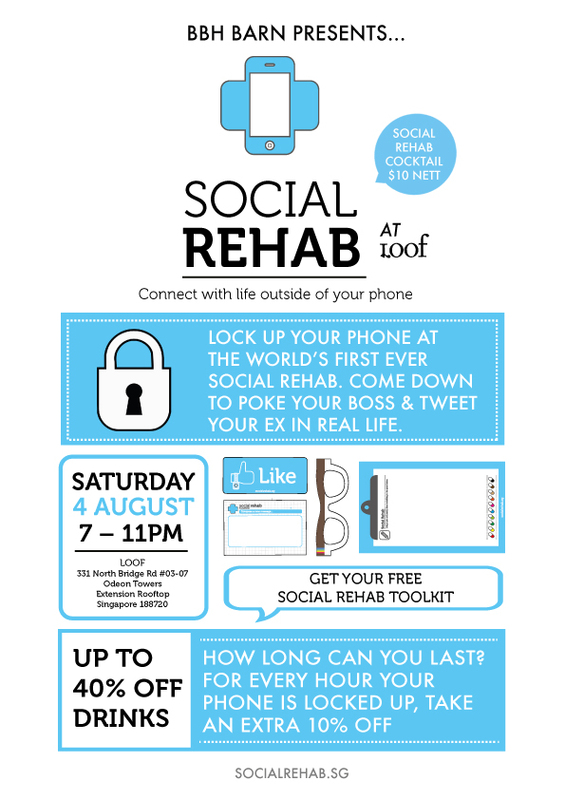 Social Rehab aims to get people to log off their social networks when they are out with friends, and get back into real life friendships. The toolkit has been distributed across Singapore’s leading nightspots in the lead up to the event to get people to choose real life fun with friends rather than ignoring them for smartphone activity. The event will then house the world’s first phone locker system, where patrons are challenged to lock up their cellphones to unlock drinks promotions. For people who do not have the opportunity to visit the venue, the toolkit is also available as a printable template to make at home. A limited run of 100 kits are available on request online, free of charge. The website will also house a guide to 21st Century Cellphone Etiquette which will be a constant shareable reminder of the aim of this campaign. Social Rehab has been well-received and is backed by influential local bloggers. Videos documenting prolific smartphone addicts undertaking Social Rehab are featured on SocialRehab.sg. Lifestyle bloggers The Cambelles and fashion blogger Yiqin will all be asked to put away their phones for an evening with their friends, using the rehab kit to rekindle uninterrupted conversation and fun. Social Rehab has reached over half a million plus consumers in 5 days of launch. Started a global online discussion through Twitter, including website coverage from Netherlands through to South America and Australia. From thousands of interactions, currently Social Rehab has in excess of a 95% positive engagement rate. Social Rehab has completely sold out of Rehab Kits in less than a week, with requests still rolling in. Down the printable pdf. See the SocialRehab Facebook page, Loof Event Facebook page and Twitter page @_socialrehab.